Crate training is a method of house training your puppy or dog. The crate is used to keep your dog confined when you are not able to supervise. Since most dogs will not urinate or defecate in the same place they sleep, your dog will most likely try to hold the urge when it is confined to its crate. 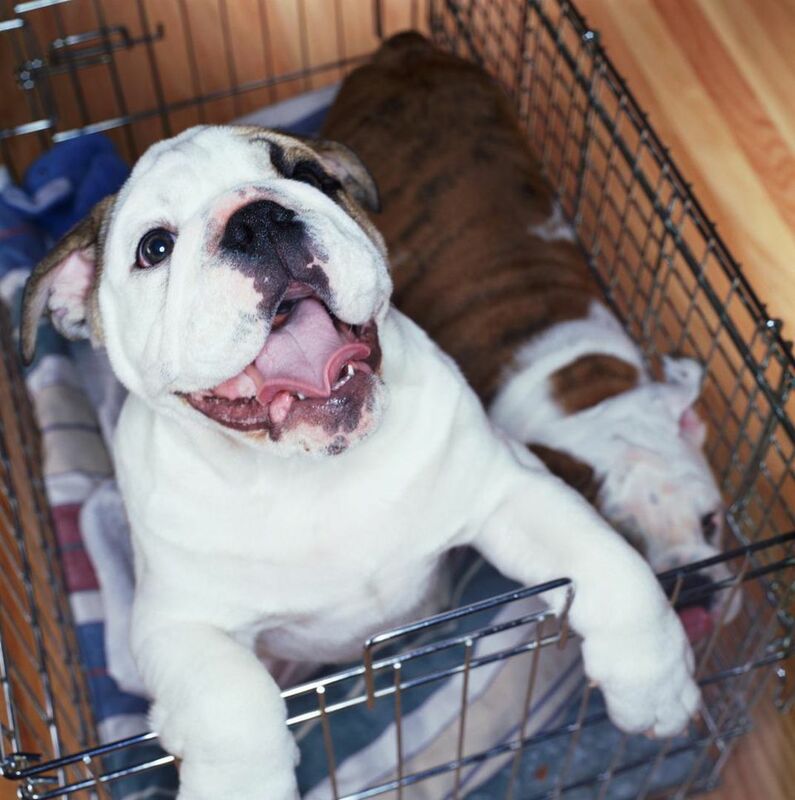 When used correctly, a crate prevents the dog from getting in the bad habit of having accidents in your home and gives it a safe space that is akin to a doggie sanctuary. There are several different types of crates to choose from, including a wire cage, a plastic pet carrier, and a soft-sided canvas or nylon crate. The wire crate is the most commonly used. It allows your dog to see what is going on around it, and many have an extra panel which allows you to make the crate bigger or smaller depending on the size of your dog. This type of crate is collapsible, and it has a sliding tray in the floor which makes it easy to clean. A plastic pet carrier is also a good option for crate training. This is the kind you most often see used for airline travel. The drawback to this kind of crate is that it is enclosed on three sides, so it does not let in as much light as a wire crate. It is also a little harder to clean. The soft-sided crates are lightweight, so they are great to carry along when you are traveling with your dog. The problem with the soft-sided crates is that a dog who likes to chew or scratch at the sides will be able to break out. It is not a good choice for young puppies. Whichever type of crate you choose to use, size is important. The crate should not be too large. You want your dog to have enough room to lie down comfortably and turn around. If the crate is too big, your dog may use one area of the crate to sleep and another spot to eliminate. Many of the wire crates are sold with a divider. This is perfect if you are crate training a growing puppy. The divider allows you to confine your puppy to a small area of the crate and then make the crate larger as your puppy grows. Crate training should be kept very positive. Introduce your puppy or adult dog to the crate slowly. Put something soft in the bottom of the crate, along with some of your dog's toys. Throw some treats inside. Let your dog explore the crate at its own pace without forcing it to go inside. Praise the dog and give it a treat when it goes in on its own. Until it seems comfortable with the crate, keep the door open and let your dog wander in and out as it wishes. Dogs are den animals, and they like having a safe and secure place to call their own. If crate training is done correctly, crates can provide this safe haven, in addition to giving you peace of mind while you are not at home. Dog owners often report that their dogs continue to seek out their crates long after housetraining has been accomplished. For others, once the dog is able to be left alone for several hours without having an accident or becoming destructive, they stop using the crate and allow their dogs free run of their homes while they are out. Once your dog is comfortable going in and out of the crate, it is time to start getting it used to confinement. Throw some treats in the crate, and once your dog is inside, close the door. Wait a minute or so, and as long as your dog is quiet, let it out of the crate. Slowly extend the amount of time you leave your dog in the crate while you are at home until it is comfortable being confined in the crate for up to an hour or more. Once your dog is comfortable with being confined, start getting it used to being left alone while in the crate. When your dog is calm in the crate, step out of the room for a few minutes and then step back in. Gradually build up the amount of time you are out of the room until your dog or puppy is comfortable being left alone in the crate for an hour or more. Never use your dog's crate to punish it. Your dog should consider its crate a happy, comfortable, and safe place. If you use the crate to punish your dog, chances are it will be fearful and anxious when left in it. It is also important that you never let your dog out of the crate while it is whining or barking; it should be completely calm before you release it. Opening the crate while it is barking or whining teaches that if the dog makes enough noise, it will be let out. Making this mistake can lead to many sleepless nights as you wait for your puppy to settle down. Finally, never leave your dog crated for longer than it is physically able to hold its bladder or bowels. Puppies can usually hold it for no more than three to four hours. An adult dog who has never been housetrained should also not be left for longer than three to four hours. Older dogs may be able to hold it a little longer. Dogs should not be left crated for more than this length of time without being taken out for exercise, playtime, and time to cuddle with you.